The second Gunni Gras is in the works ! Join this fun Annual Pub Crawl as you wander to all the sponsors sampling tasty, creative appetizers and special themed evening beverages at Timbers Sports Bar, Blackstock Bistro, Garlic Mike’s, Palisades Restaurant, Ol’ Miner Steakhouse, the dive pub, Gunnison Pizza Company, and the featured evening meal provided by Burnells Farmhouse Eatery served at Timbers Sports Bar. Seven great stops on the route. Again, this year, we will have a shuttle service provided by chamber member Alpine Express, making it easy to hit all the crawl locations. Must be 21+ to participate. 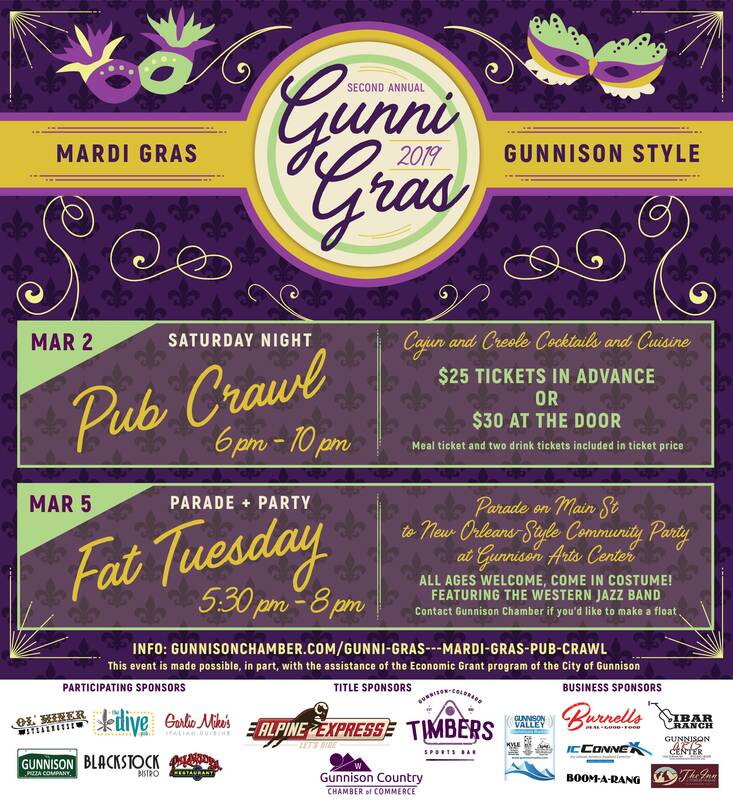 Driving down from the north and wanting to stay and not drive home – the Inn at Tomichi Village will be offering a special rate for Gunni Gras participants – call them at 970 641 1131 to reserve your room.